The Salt Lake Temple of the Church of Jesus Christ of Latter-day Saints is the largest attraction in the city's Temple Square. The Church of Jesus Christ of Latter-day Saints, widely known as the "LDS Church" or the "Mormon Church," is the largest and most well-known denomination within the Latter Day Saint's movement. Founded in the United States by Joseph Smith Jr. in 1830, the Latter-day Saints regard Christ as the head of their church and count themselves as Christians, but do not consider themselves part of the Catholic, Orthodox, or Protestant traditions. 1.1 The Founder – Joseph Smith, Jr. 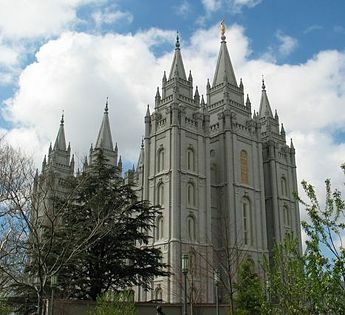 The Church is headquartered in Salt Lake City, Utah, and is said to be the fourth largest religious body in the United States. It is an example of a popular new religious movement whose membership continues to grow due to active missionary activity. The Founder – Joseph Smith, Jr. The Church of Jesus Christ of Latter-day Saints was officially founded by Joseph Smith, Jr. (1805 – 1844) and five associates on April 6, 1830, in Fayette, New York. Profile of Joseph Smith, Jr. (circa 1843). Joseph Smith was the founder and first president of the church. When Smith was fourteen years old, he claimed to have had a religious experience, in which both God the Father and Jesus Christ spoke to him and instructed him not to affiliate himself with any denomination. Three years later, he reported being visited again by a heavenly angel named Moroni who told him that a book written on gold plates had been buried and Smith had been charged with its protection. Smith allegedly retrieved the gold plates in 1827 and began the process of translating their engravings. 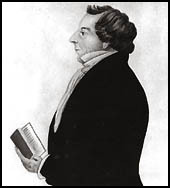 On March 26, 1830, when his dictation was complete, Smith published the work as the Book of Mormon. (In recent years, the subtitle Another Testament of Jesus Christ was added.) Shortly thereafter, on April 6, 1830, Smith also founded the first Church of Jesus Christ of Latter-Day Saints church. To avoid conflict and persecution encountered for his claims, Smith and his followers moved to Kirtland, Ohio early in 1831. Here the church's first temple was built and some Mormons believed erroneously that Jesus' Millennial reign had begun. However, the controversy and mob violence that had plagued Smith followed him to Kirtland and in early 1832, Joseph was dragged from his bedroom in the dead of night, tarred and feathered, and left for dead. Smith recovered and on January 12, 1838, he and many of his followers moved to Missouri to escape mob violence. It is reported that Smith received revelations identifying western Missouri as Zion, the place for Mormons to gather in preparation for the Second Coming of Jesus Christ. Independence, Missouri, was identified as "the center place" and the spot for building a temple. Smith first visited Independence in the summer of 1831, and a site was dedicated for the construction of the temple. The Latter Day Saints had been migrating to Missouri ever since Smith had claimed the area to be Zion. After Smith had been forced out of Kirtland in 1838, he, and the rest of the remaining Latter Day Saints from Kirtland, came to Missouri. Soon afterward, Mormon converts, most of them from the New England area, began immigrating in large numbers to Independence and the surrounding area. However, the Missouri period of Smith's history was also marked by many instances of violent conflict and legal difficulties for Smith and his followers. Many of the local inhabitants were distrustful and resentful of Smith's followers and feared them. Latter Day Saints tended to vote in blocks, giving them a degree of political influence wherever they settled, and they purchased vast amounts of land in which to establish settlements that threatened the previous residents of the community. The tension was further fueled by the Mormon belief that Jackson County, Missouri, and the surrounding lands were promised to the church by God and that the Latter Day Saints would soon dominate the area. A military expedition was led by Joseph Smith to re-take Jackson County by force of arms, otherwise known as Zion's Camp. Smith and his followers were warned by the Clay County Sheriff that they would be committing treason if they crossed over into Jackson County so armed. However, cholera overtook many of Smith's men, so Smith was forced to return back to Kirtland, Ohio. In June 17, 1838 a sermon given by Sidney Rigdon was viewed by some as a declaration of war against the residents of Missouri. All of these things caused many local leaders and residents to see the Latter Day Saint community as a threat to their safety. Later that year, many of the "old Missourians" and the LDS settlers began and engaged in an ongoing conflict often referred to as the Mormon War. One key skirmish was the Battle of Crooked River, which involved Missouri state troops and a group of Latter Day Saints. There is some debate as to whether the Mormons knew their opponents were government officials. This battle led to reports of a "Mormon insurrection." In consequence of these reports, including sworn affidavits by ex-Mormons that the Mormons were planning to burn both Liberty and Richmond, Missouri, Missouri Governor Lilburn Boggs issued an executive order known as the "Extermination Order" on October 27, 1838, stating that the Mormon community had "made war upon the people of this State" and that "the Mormons must be treated as enemies, and must be exterminated or driven from the State if necessary for the public peace." The Extermination Order was not officially rescinded until 1976 by Governor Christopher S. Bond. The legality of Boggs' "Extermination Order" was debated in the legislature, but its objectives were achieved. Most of the Mormon community in Missouri had either left or been forced out by the spring of 1839. After leaving Missouri in 1839, Smith and his followers made headquarters in a town called Commerce, Illinois on the banks of the Mississippi River, which they renamed Nauvoo. Nauvoo means "to be beautiful"—the word is found in the Hebrew version of Book of Isaiah 52:7. Latter Day Saints often referred to Nauvoo as "the city beautiful," "the city of Joseph," or a similar nickname. City of Joseph was actually the name of the city for a short time after the city charter was revoked. They were granted a charter by the state of Illinois, and Nauvoo was quickly built up by the faithful, including many new arrivals. In October 1839, Smith and others left for Washington, DC to meet with Martin Van Buren, then the president of the United States. Smith and his delegation sought redress for the persecution and loss of property suffered by the Latter Day Saints in Missouri. Van Buren told Smith, "Your cause is just, but I can do nothing for you." Work on a temple in Nauvoo began in the autumn of 1840. The cornerstones were laid during a conference on April 6, 1841. Construction took five years and the edifice was dedicated on May 1, 1846; about four months after Nauvoo was abandoned by the majority of its citizens under threats of mob action. Nauvoo's population peaked in 1845 when it may have had as many as 12,000 inhabitants (and several nearly as large suburbs)—rivaling Chicago, Illinois, whose 1845 population was about 15,000. Due to increasing tensions, critics suggested that Nauvoo's charter should be revoked, and the Illinois legislature considered the notion. In response, Smith petitioned the U.S. Congress to make Nauvoo a territory. His petition was declined. In February, 1844, Smith announced his candidacy for President of the United States, with Sidney Rigdon as his vice-presidential running mate. Violent threats were made against Smith and the Mormon community. Charges were brought against Smith and he submitted to incarceration in Carthage, Illinois. The governor of the state, Thomas Ford, had promised protection and a fair trial but failed to keep either of these promises. On June 27, 1844, a mob of about 200 men stormed the jail and killed Joseph Smith, along with his brother Hyrum. Smith left ambiguous or contradictory succession instructions that led to a crisis in the early church. Several church members claimed rights to leadership. An August 8, 1844 conference that established Brigham Young's leadership is the source of an oft-repeated legend. Multiple journal and eyewitness accounts from those who followed Young state that when Young spoke regarding the claims of succession by the Quorum of the Twelve Apostles, he appeared to look or sound like the late Smith. Although many of these accounts were written years after the event, there were contemporary records. Most Latter Day Saints followed Young, but some aligned with other various people claiming to be Smith's successor. One of these was Smith's own son, Joseph Smith III, who in 1860 led the Reorganized Church of Jesus Christ of Latter Day Saints, now called the Community of Christ church. Many of these smaller groups were spread throughout the midwestern United States, especially in Independence, Missouri. Reverberations of the succession crisis continue to the present day. Mob violence and conflict continued to grow and threaten the Mormon establishment at Nauvoo. By 1847, the city was deemed unsafe and Young led many Latter Day Saints out of the United States and into Utah, which was then Mexican territory. Faced with further persecution in Illinois, members of the church eventually followed Brigham Young to the Salt Lake Valley, and settled a large area now encompassed by the state of Utah and parts of Arizona, California, Nevada, Idaho, and Wyoming. 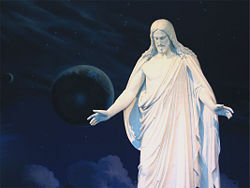 The Church of Jesus Christ of Latter-day Saints shares many beliefs in common with other Christian groups, though it differs in theology from these traditions, especially in its ideas about God and the Trinity, Salvation and Heaven. 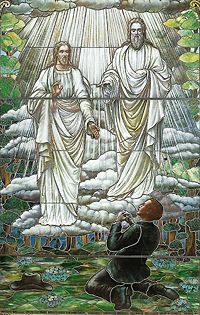 LDS theology understands that God the Father, Jesus Christ, and the Holy Ghost are three separate and distinct personages who together comprise the Godhead or the Holy Trinity (which is different from the doctrine of the Triune God in other Christian traditions, which maintains that the three are one being). All three members of the Godhead are eternal and equally divine, but play somewhat different roles. While the Holy Ghost is a spirit without a physical body, God and Christ do possess distinct, perfected, physical bodies of flesh and bone. Although Mormon theology sees the Father, the Son, and the Holy Ghost as separate beings, they are considered to be "one God" in purpose. The term Plan of Salvation (a.k.a. the Plan of Happiness) is used to describe how the gospel of Jesus Christ is designed to bring about the immortality and eternal life of humankind. It includes the Creation, the Fall, and the Atonement, along with all God-given laws, ordinances, and doctrines. Members believe that after this life is the Resurrection and Judgment. The gift of immortality is also believed to be freely given to all because of Jesus' sacrifice on the cross and his subsequent Resurrection, although salvation from sin is conditional. Entrance to the highest Heavenly Kingdom, the "Celestial Kingdom," is only granted to those who accept Jesus through baptism into the church by its priesthood authority, follow Church doctrine, and live righteous lives. Faith alone, or faith without works is not considered sufficient to attain exaltation. According to the Church, the Celestial Kingdom (whose glory is compared to the brightness of the sun in the sky, whose inhabitants have all truth and light) is where the righteous will live with God and their families. This kingdom includes multiple degrees of glory, the highest of which is exaltation. Those who have had the ordinances of eternal marriage, which is performed in temples, and baptism may be exalted if they are found worthy by God. Accountable individuals must be baptized and repent to gain entrance to the Celestial Kingdom; Latter-day Saints profess that all children who die before the age of accountability (eight years old) automatically inherit a celestial glory. Good people who do not follow Jesus or accept the Gospel (as understood by the church) do not qualify for exaltation and will be consigned to the Terrestrial Kingdom (whose glory is compared to the brightness of the moon in the sky). This kingdom is one of great glory, but without the presence of God the Father. An ultimate willingness to keep the Ten Commandments is considered essential to enter this kingdom. Murderers, other criminals, and the like who do not accept the Atonement of Jesus Christ will eventually spend eternity with people of like intent in the Telestial Kingdom, and their glory will be as that of the stars in the night sky. This is also considered a kingdom of glory and has been described as being much better than even earthly life. All those who do not qualify for a higher degree of glory will automatically enter this kingdom unless they deny the Holy Ghost, a sin it is believed very few people are able to commit. Those few people who do, after gaining a full knowledge of the Gospel, willfully deny and contend against the Holy Ghost, are believed to inherit no glory. Most members of the church refer to this place as Outer Darkness. An individual so banished is called a Son of Perdition. Forgiveness is not possible for these souls, though they will be resurrected and judged by Jesus Christ during the Second Coming. The Church of Jesus Christ practices baptism by immersion in water. Baptism is symbolic of burial and rebirth as a disciple of Jesus Christ. Like many Christians, Latter-day Saints believe that a person who repents and is baptized has all prior sins remitted. Baptism is never performed before the eighth birthday. The age of eight was given in Latter-day revelation as the age when children become accountable for their sins. If a person is unable to discern between right and wrong (i.e. those with limited mental capacities) they are deemed unaccountable for their sins and do not require baptism, regardless of their age. The Book of Mormon and modern revelation specifically forbids the practice of infant baptism. (See Doctrine and Covenants 68:27 and Moroni 8:4-23.) Baptism is recognized only when performed by one holding the proper authority, contained in the office of a priest in the Aaronic Priesthood, or a higher office. Latter-day Saints also practice baptism for the dead, a practice that is unique to the church. This practice is a baptism by proxy and is performed in a temple by worthy members. This practice is believed to only take effect if the deceased person has repented of their sins and accepted the ordinance. Following baptism by immersion in water, individuals are confirmed members of the church and given the gift of the Holy Ghost by the laying on of hands by priesthood bearers worthy to do so. Latter-day Saints believe that this blessing entitles the newly confirmed recipient to have the constant companionship of the Holy Ghost as a guide and guardian so long as the recipient lives worthy of the gift. Moreover, members believe that those who have not been confirmed may still receive inspiration and a witness from the Holy Ghost but are not entitled to constant companionship available through the gift of the Holy Ghost. Under the church's doctrine of continuing revelation, the church has an open scriptural canon which thus far includes the Hebrew Bible, Christian New Testament (King James Version), The Book of Mormon: Another Testament of Jesus Christ, The Doctrine and Covenants, The Pearl of Great Price, and The Articles of Faith. These scriptural writings comprise the Standard Works of the Church. The LDS's belief in additional scriptural canon makes the church unique among Christian groups. Though the canon is still open, documents are not added frequently. According to tradition, the Book of Mormon details the journey of nations from Jerusalem in 600 B.C.E. called the Nephites and the Lamanites to the Americas, and another group called the Jaredites who existed there prior. It also details the ministry of the resurrected Jesus Christ to the Nephites. The Doctrine and Covenants is a collection of revelations, policies, letters, and statements from church presidents, starting with Joseph Smith. This record contains church doctrine as well as direction on church government. The Pearl of Great Price contains: (1) excerpts from Joseph Smith’s translation of Genesis, called the book of Moses, and of Matthew 24, called "Joseph Smith—Matthew"; (2) Joseph Smith’s translation of some Egyptian papyrus that he acquired in 1835 (and subsequently lost, although some pages were purportedly rediscovered in 1967), called the "Book of Abraham"; (3) an excerpt from The Documentary History of the Church containing a letter written by Joseph Smith in 1838, called "Joseph Smith—History"; and (4) an excerpt of another of Joseph Smith's letters called the Articles of Faith, thirteen statements of belief and doctrine. Initially, when the church was organized in 1830 it was called the "Church of Christ". However, in April 1838, the full name was changed to "the Church of Jesus Christ of Latter Day Saints." Today, the Church is commonly referred to as the "LDS Church" in Utah and surrounding areas, while it is more often known as the "Mormon Church" throughout the rest of the world. Church members are often known simply as "Mormons," "the Saints," or "Latter-day Saints" with the latter two labels being the preferred terms by most members themselves. The nickname "Mormon" arose soon after the publication of The Book of Mormon in 1830. Although originally used pejoratively to refer to the church or its members, the term came to be used within the church. The Church of Jesus Christ of Latter-day Saints is led by a president, who is revered as a prophet, seer, and revelator. The president is entitled to receive revelation from God to guide the church. Other authorities of the church include apostles, seventies, stake presidents, and bishops. Within the church there are two important apostolic bodies: the "Quorum of the Twelve Apostles" and the "Quorum of the Seventy." The "Quorum of the Twelve" is in place directly under the president, and the "Quorum of the Seventy" (referred to as "Seventies") ranks below the Twelve. The president of the church serves as such until death, after which the "Quorum of the Twelve Apostles" will meet, pray, and under the leadership of the senior apostle, receive revelation as to whom the next prophet should be. Although not specified by revelation, the senior apostle has historically become the new president of the church. Members of The Church of Jesus Christ of Latter-day Saints address each other as "Brother" or "Sister" and then usually append the last name (such as Brother Smith, or Sister Young). Additionally, those that hold specific leadership positions may be addressed by their title and then their last name (such as President Kimball). Congregations for Sunday services are grouped geographically, with larger (200 to 400 people) congregations known as "wards," and smaller (less than 200 people) congregations known as "branches." Bishop – Bishops of a ward are addressed by the title of "Bishop." There is also a position in the LDS church referred to as the Presiding Bishop. The Presiding Bishop oversees the welfare services of the church. Elder – While most adult male Church members hold the office of "elder," in general only full-time male missionaries (proselyting or service), members of any of the "Quorums of the Seventy" (General and Area Authorities), and members of the "Quorum of the Twelve Apostles" are addressed with this title. President – In a ward, the Elder's Quorum President is referred to as "President." Other presidents within the ward, such as the Teachers or Deacons Quorum President, may be referred to with this title. In addition to the above presidencies, in a branch, the branch president is referred to as "President," and his councilors are referred to as "Brother." All members of a stake (or district) presidency, a temple presidency, a mission presidency, the presidency of the Seventy, and the first presidency are referred to as president. Weekly worship services, including sacrament meetings, are held on Sundays, in meeting houses, also referred to as "chapels" or "stake centers." All people, regardless of belief or standing in the church are welcome to attend. The Sacrament, similar to Communion or the Eucharist in other churches—consecrated bread and water (in place of wine) in remembrance of the body and blood of Christ—is offered weekly. The primary Sunday service is sacrament meeting and attended by the combined congregation. The foremost purpose of sacrament meeting is the blessing and passing of the Sacrament to members of the church. After the Sacrament, the service usually consists of two or three "talks" (lay sermons) prepared and delivered by members of the congregation. Once a month however, usually on the first Sunday, instead of prepared talks, members are invited to bear their testimonies about gospel principles. Hymns are sung throughout the service. During the other two segments, the congregation divides into smaller groups based on age and/or gender. The church publishes manuals for each type of class, usually including a teacher's manual as well as a student booklet for youth and adult classes. In addition to Sunday worship, members of the church may participate in ordinances in temples, including baptisms for the dead, endowments, and eternal marriage. Adult members who receive their endowments in the temple also receive the temple garment, which they wear under their daily clothing. The LDS church considers the temple ordinances exceptionally sacred. As such, they do not publicly release the details of the temple proceedings and expect that members also do not discuss them outside the temple. This is true of the significance of the temple garment as well. Practices distinctive to Latter-day Saints include following the "Word of Wisdom" (caring for one's body by eating healthy foods; abstaining from alcohol, tobacco, tea and coffee, and illicit drugs; and eating meat sparingly), tithing (donating 10 percent of one's income to the church, which is voluntary), chastity, modesty in dress and behavior, lay leadership, family home evenings (families are encouraged to meet weekly for prayer and other activities), and home and visiting teaching (members regularly visit one another in their homes for prayer and study). The LDS Church has one of the most active missionary programs of any world church. Missionary work is a fundamental principle of the church, and has become one of the most readily identifiable characteristics of The Church of Jesus Christ of Latter-day Saints. All missionaries have been assigned by church headquarters to their area of work, which can be in any part of the world where governments allow them to preach. They support themselves financially for up to two years, and often learn a second language. The church also places an emphasis on humanitarian services, and vast family history resources. At one time in its early history, the church did endorse a form of polygamy called "plural marriage," but this is no longer the case. Smith may have begun practicing a form of polygyny, later called plural marriage, perhaps as early as 1833. Polygamy (marriage to multiple partners) was illegal in many U.S. states, and was widely perceived as an immoral and misguided practice. Many of those that practiced polygamy pointed to the prophets in the Bible who also had multiple wives including Abraham, Isaac, and Jacob. However, Smith is on record as having spoken against polygamy and claiming his innocence of these charges. Smith continued to deny practicing polygamy until his death . Critics cite this as a deliberate deception by Joseph Smith. The practice of polygamy was officially withdrawn as stated in a declaration called "The Manifesto" which was given by President Wilford Woodruff in 1890 (see Official Declaration 1), which advised church members to obey the marriage laws of their land. The church's position was reiterated and clarified in 1904 (commonly referred to as "The Second Manifesto"), with an additional request that no church members enter into any form of plural marriage, regardless of their location, local customs, or legality. Members of The Church of Jesus Christ of Latter-day Saints found to be engaging in multiple marriage relationships are excommunicated. Converts from areas where polygamy is an accepted practice typically must end such relationships. Latter-day Saints do not use the Christian cross or crucifix as a symbol of their faith. Most modern Latter-day Saints choose to focus upon Jesus' life, atonement, and resurrection, not his death. One of the central visual symbols of the church is the trumpeting angel Moroni, proclaiming the restoration of the "true gospel" to the Earth (usually identified as the angel mentioned in Revelation 14:6–7); and a statue depicting the angel often tops the tallest spire of LDS temples. Another common symbol in the church is the letters CTR, meaning "Choose the Right," taken from the name and motto of a children's primary class. Dialogue: A Journal of Mormon Thought Read 40 years of the best Mormon studies by top LDS scholars, researchers, and writers on all topics that relate to the Mormon experience. History of "Church of Jesus Christ of Latter-day Saints"
This page was last modified on 22 February 2017, at 17:20.